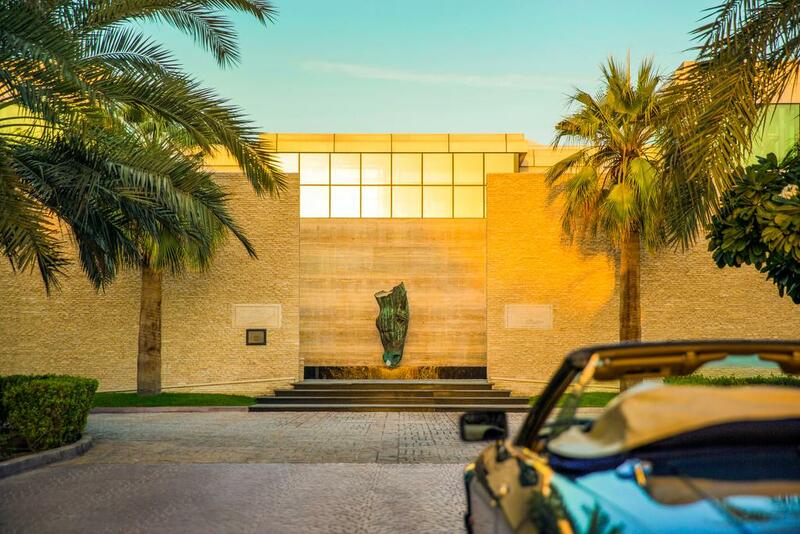 The Desert Palm is a hidden gem, located on a 160 acre estate, around 25 minutes from Dubai centre and a mere 15 minute drive from Dubai International Airport. This luxurious resort boasts 38 spacious rooms, including suites and villas, some of which include their own private pool, with sundeck, sunbeds and an outdoor dining area. There are two first-rate restaurants to choose from, and a bar with an extensive selection of in- house infused spirits and imaginative cocktails. One of the best highlights here is the newly launched Samāna Spa, featuring Dubai’s only apothecary style Aromatherapy Bar (by Tisserand),where each spa treatment journey starts with a homeopathic consultation with an experienced spa ‘Guru’ so they can expertly match the individual needs of each guest with the perfect essential oils for their treatment to make a bespoke and highly beneficial experience. Additional spa partners have been carefully handpicked and include Hungarian skincare experts, Eminence Organics for facials, and VOYA for detoxifying body treatments.There is an on-site gym, alongside magnificent architecture, an abundance of lush green lawns, including four manicured grass polo fields; the Desert Palm certainly oozes class. I arrived at the hotel at 12:30, ready for some rest and relaxation after spending three nights in the lively Jumeriah Beach area. I was mindful that check-in time wasn’t until 15:00, however I was more than willing to spend some time exploring the pool area and beautiful hotel surroundings, until my room was ready. Following check-in, I was lead to the Epicure pool side restaurant for a much-needed refreshment, and before I knew it, around 20 minutes later, my room was ready. I was collected from the restaurant by Nilraj, who showed me to my room. Out of the seven different room choices at this hotel, I was allocated a Polo Suite. Whilst I was checking out my suite, a complimentary fruit bowl arrived, which was placed carefully next to the chocolates, which had already caught my attention. My suite was a spacious, open plan design, and included a standalone bath tub, a fabulous rain shower, an Emperor sized bed, and private balcony overlooking the main championship polo field. Each room in this resort offers a high tech entertainment system, including Bose sound and an LED TV, with Airplay and Chromecast capabilities. There was a Nespresso machine, which, as a coffee enthusiast, went down a treat! I had a tour of the estate by the lovely Lekhnath, who drove me around in a golf buggy. The highlight of the tour was definitely visiting the stables and meeting some of the polo ponies! Lekhnath explained that there are approximately 300 horses which are stabled, trained and played within the Desert Palm estate, and there’s even a riding school. Following the tour, I spent the afternoon lazing by the incredibly inviting infinity pool. Could life get any better right now? I was certainly in my element. I had a reservation for dinner that evening in the main restaurant, Rare; which specialises in chargrilled meats and fresh seafood. However, as it was Ramadan during my stay, I had an Iftar, which is the meal eaten by Muslims after sunset while they’re fasting. I opted for a selection of hot Mezzeh from the buffet for my starter, and for my main I ordered the saffron risotto. The food, along with the mesmerising view from the terrace, was absolutely superb. Following a very restful nights sleep in my huge bed, breakfast was served at the Epicure restaurant. My favourite kind of breakfast is any sort of egg and smoked salmon combo, so I was delighted when I spotted scrambled eggs and smoked salmon on a toasted bagel! I also opted for a strawberry and kiwi smoothie. There is an abundance of healthy menu choices, including an extensive list of raw and fresh juice blends, homemade healthy smoothies, green teas and herbal infusions. The weather in Dubai during my stay was hot hot hot!! It reached 40 degrees during the day, which meant regular submersions into the pool were imperative, whilst working on my tan. I got chatting to one of the other guests, who commented on how fantastic the on-site spa is. Therefore, I was super excited for my 60-minute massage I had booked in that afternoon! My therapist at the Samana Spa was called Moi. Upon my arrival, I completed a treatment questionnaire and was asked to choose an oil from a pre-blended selection available. I was then lead into one of the serene treatment rooms and given a small portion of lemon and lime sorbet, which I consumed whilst Moi cleansed my feet. The sorbet was delicious and so refreshing; it was exactly what I needed following a morning of baking in the intense heat. My 60 minute deep tissue massage was absolutely divine! The treatment card asked me to specify any areas I wanted the therapist to focus on, to which I indicated my neck and back. Moi was clearly an experienced therapist and spent just the right amount of time on each part of my body. I was so incredibly chilled out and relaxed, I really struggled to stay awake. My treatment culminated in a cup of fine camomile and ginger green tea, whilst relaxing in the chill out area. I then retired to my room and had a soak in the wonderful standalone bath. Perfect. For dinner, I had a reservation at Epicure. I opted to sit outside, by the beautiful infinity pool and perused the menu, enjoying a cold glass of New Zealand Pinot Gris, whilst watching the magnificent sunset over the beautiful Dubai skyline on the horizon. Bliss! I chose the Vietnamese fresh spring rolls to start with, and for my main I had the pan-fried salmon, which was served with a lemon and cherry tomato salsa, pea mash and zucchini shavings. Both courses were excellent; In fact, every meal I’ve had during my break here has been outstanding. The food has most certainly been the highlight of my stay. The Desert Palm certainly delivered in every aspect during my stay. 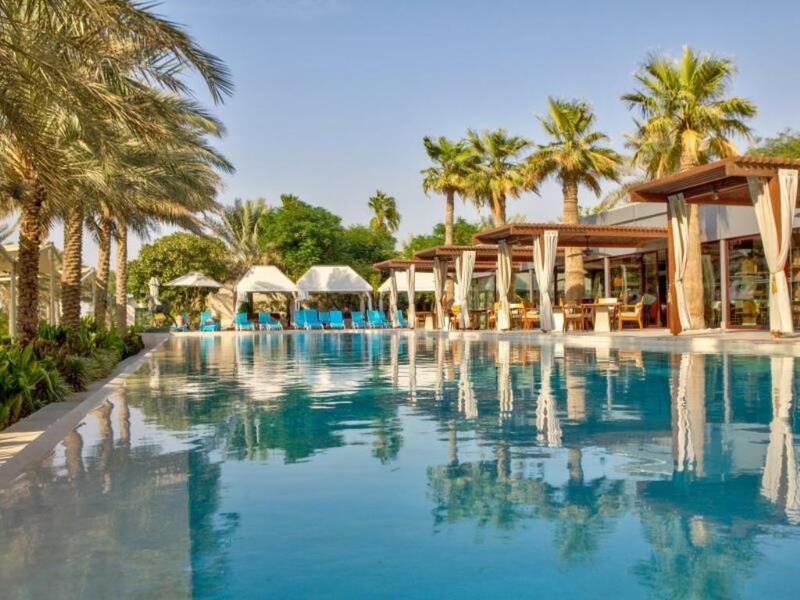 If you’re looking for a slice of luxury, to relax and unwind in a stunning setting, or some light relief away from the hustle and bustle of the city, then The Desert Palm is the place to be. Nightly rates at Desert Palm Dubai start from £195 on a B&B basis.PO Box 119171, Dubai.